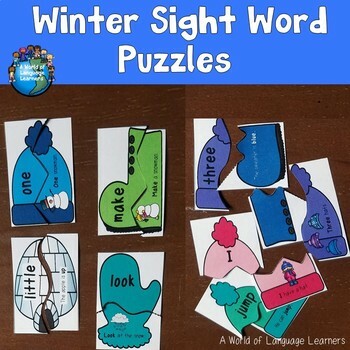 Help students learn basic sight words with these winter themed puzzles. 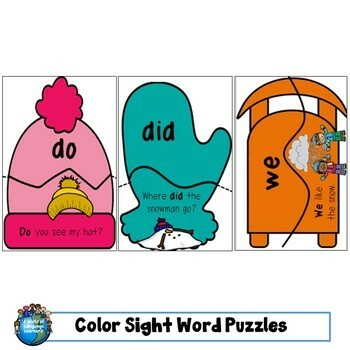 Each puzzle has a sentence or phrase with a bold focus sight word. Students match up the another puzzle piece with the same sight word. The puzzles are self correcting. This is a great way for students to practice reading high frequency words in context. Each puzzle includes a picture that will help students comprehend the meaning of the sentence or phrase. Great for ELLs. Three levels of sight words are included: Pre-primer, Primer, First Grade. 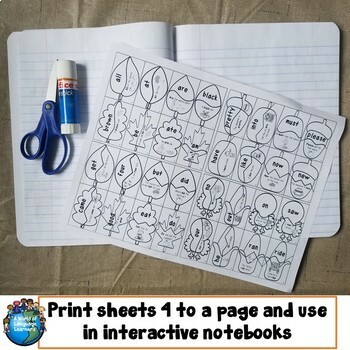 These are also available as part of a money savings bundle in my Sight Word Puzzle Bundle. These are also available as part of a money savings bundle along with additional sight word materials in my Sight Word Mega Bundle.